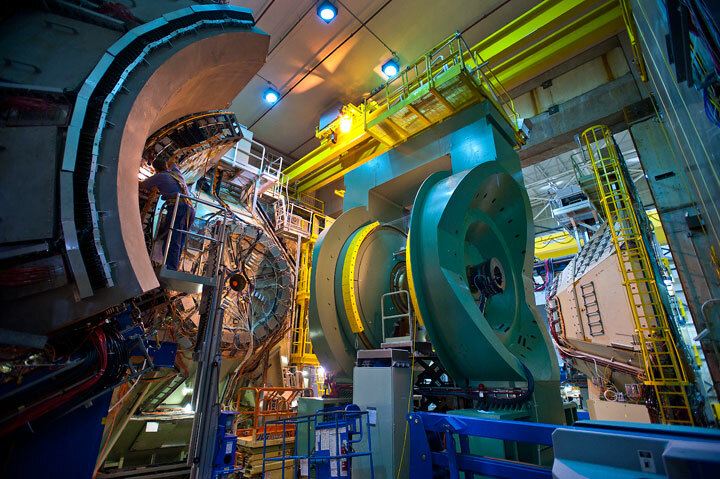 Findings on how differently sized nuclei respond to spin offer new insight into mechanisms affecting particle production in proton-ion collisions at the Relativistic Heavy Ion Collider (RHIC). The PHENIX detector at the Relativistic Heavy Ion Collider (RHIC). That’s similar to the shocking situation scientists found themselves in when analyzing results of spinning protons striking different sized atomic nuclei at the Relativistic Heavy Ion Collider (RHIC)—a U.S. Department of Energy (DOE) Office of Science User Facility for nuclear physics research at DOE’s Brookhaven National Laboratory. Neutrons produced when a spinning proton collides with another proton come out with a slight rightward-skew preference. But when the spinning proton collides with a much larger gold nucleus, the neutrons’ directional preference becomes larger and switches to the left. 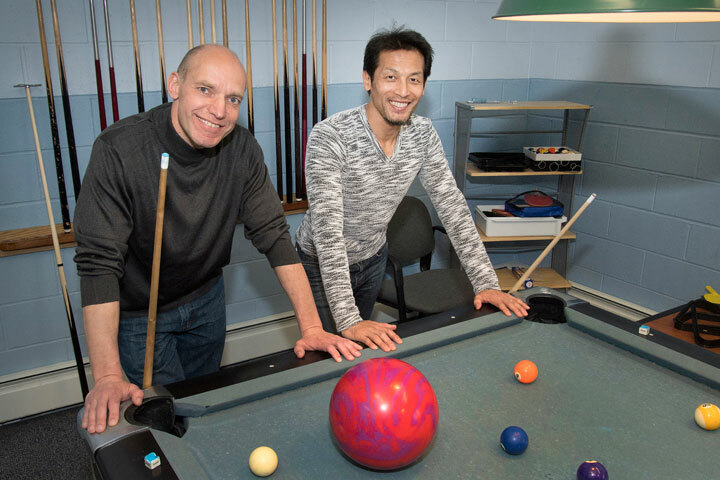 Brookhaven Lab physicist Alexander Bazilevsky and RIKEN physicist Itaru Nakagawa use billiards and a bowling ball to demonstrate surprising results observed at the Relativistic Heavy Ion Collider’s PHENIX detector when small particles collided with larger ones. Understanding different particle production mechanisms could have big implications for interpreting other high-energy particle collisions, including the interactions of ultra-high-energy cosmic rays with particles in the Earth’s atmosphere, Bazilevsky said. Spin physicists first observed the tendency of more neutrons to emerge slightly to the right in proton-proton interactions in 2001-2002, during RHIC’s first polarized proton experiments. RHIC, which has been operating since 2000, is the only collider in the world with the ability to precisely control the polarization, or spin direction, of colliding protons, so this was new territory at the time. It took some time for theoretical physicists to explain the result. But the theory they developed, published in 2011, gave scientists no reason to expect such a strong directional preference when protons were colliding with larger nuclei, let alone a complete flip in the direction of that preference. Neutrons produced when a spin-aligned (polarized) proton collides with another proton come out with a slight rightward-skew preference. 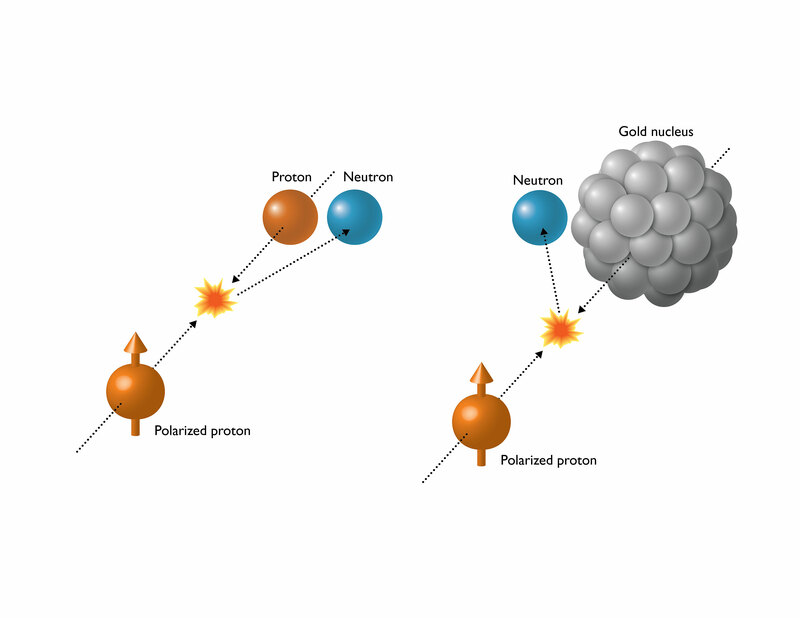 But when the polarized proton collides with a much larger gold nucleus, the neutrons’ directional preference becomes larger and switches to the left. These surprising results imply that the mechanisms producing particles along the beam direction may be very different in these two types of collisions. “This was truly a collaborative effort between experimentalists and accelerator physicists who could tune such a huge and complicated accelerator facility on the fly to meet our experimental needs,” Bazilevsky said, expressing gratitude for those efforts and admiration for the versatility and flexibility of RHIC. “The measured asymmetry is the sum of these interactions or interferences of different processes,” said Kim. “In the collisions of protons with protons, the effect of electric charge is negligibly small,” Nakagawa said. In that case, the asymmetry is driven by interactions governed by the strong nuclear force—as the theory developed back in 2011 correctly described. But as the size, and therefore charge, of the nucleus increases, the electromagnetic force takes on a larger role and, at a certain point, flips the directional preference for neutron production. The scientists will continue to analyze the 2015 data in different ways to see how the effect depends on other variables, such as the momentum of the particles in various directions. They’ll also look at how preferences of particles other than neutrons are affected, and work with theorists to better understand their results. “If we observe exactly the asymmetry we predict based on the electromagnetic interaction, then this becomes very strong evidence to support our hypothesis,” Nakagawa said. In addition to providing a unique way to understand different particle production mechanisms, this new result adds to the puzzling story of what causes the transverse spin asymmetry in the first place—an open question for physicists since the 1970s. These and other results from RHIC’s polarized proton collisions will eventually contribute to solving this question. This work was supported by the DOE Office of Science, and by all the agencies and organizations supporting research at PHENIX. 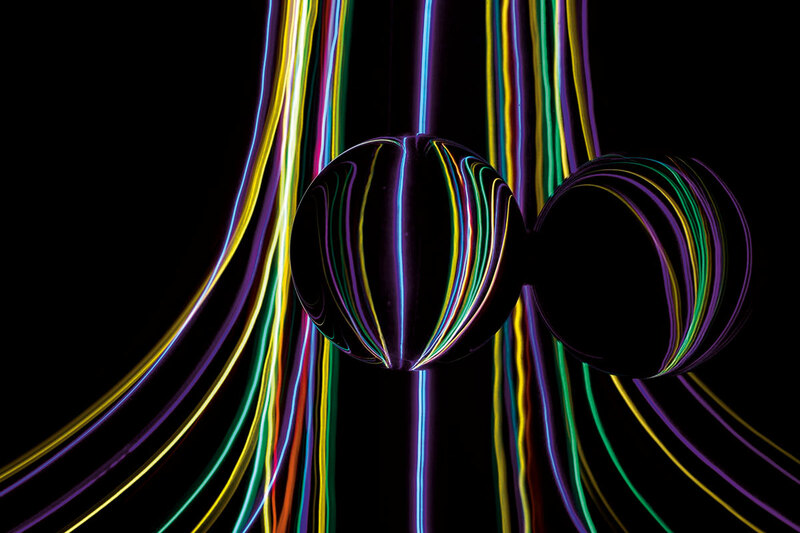 Despite decades of effort, a theory of quantum gravity is still out of grasp. Now a group of physicists have proposed an experimental test of whether gravity is quantum or not, to settle questions about the force’s true nature. The search for quantum gravity is an effort to reconcile Einstein’s general relativity with quantum mechanics, which is a theory of all the fundamental particles and the forces that act on them – except gravity. Both are needed to explain what happens inside black holes and what happened at the big bang. But the two theories are incompatible, leading to apparent paradoxes and things like singularities, where the theories break down. If gravity is a quantum mechanical force, adjacent free-falling masses, each of which is in a superposition of being in two places at once, could get entangled by gravity such that measuring the properties of one mass could instantly influence the other. To test this, Sougato Bose of University College London and his colleagues have proposed an experiment. It starts with a neutrally charged mass weighing about 10^-14 kilograms. Embedded within the mass is some material with a property called spin, which can be up or down. This mass falls through a continuously varying magnetic field, which changes the path of the mass depending on its spin. It is like the mass encounters a fork in the road and takes one path if its spin is up, and another if its spin is down. As it falls, the mass is in a superposition of being on both paths. Next, a series of microwave pulses manipulate the spin at various stages of descent and thus the paths the mass takes. At the bottom, the paths then come together again and the mass is brought to its original state. To use this set-up to test the quantum nature of gravity, two such masses would be dropped through the magnetic field. Each mass has two possible paths. This results in four possible states for the two masses combined. One of these states represents paths in which the masses come closest together. This distance should be no less than 200 micrometres to avoid other interactions that can dominate gravity. Once the masses are back to their original state, a test to see if their spin components are entangled should tell us if gravity is indeed a quantum force. The assumption, of course, is that the experiment ensures there are no other ways in which the masses can get entangled – such as via electromagnetic interactions or the Casimir force. Bose points out, however, that a null result – in which no entanglement is observed – wouldn’t constitute proof that gravity is classical, unless the experiment can definitively rule out all other interactions with the environment that can destroy entanglement, such as collisions with stray photons or molecules. Antoine Tilloy at the Max Planck Institute of Quantum Optics in Germany is impressed. But he points out that a positive result will falsify only some classes of theories of classical gravity. “That said, the class is sufficiently large that I think the result would still be amazing,” he says. The biggest hurdle to carrying out the experiment for real would be putting such relatively large masses in a superposition. The most massive objects that have been observed to be in two places at once are still orders of magnitude smaller than what is required here. But efforts to go higher are ongoing. This work is soon to be published in Physical Review Letters. Kinda way over my head, but it sounds fascinating. I think I get the gist of it! You can take any particle in the Universe and isolate it from everything else, yet there are some properties that can never be taken away. These are intrinsic, physical properties of the particle itself — properties like mass, charge, or angular momentum — and will always be the same for any single particle. Some particles are fundamental, like electrons, and their mass, charge and angular momentum are fundamental, too. But other particles are composite particles, like the proton. While the proton’s charge (of +1) is due to the sum of the three quarks that make it up (two up quarks of +2/3 and one down quark of -1/3), the story of its angular momentum is much more complicated. Even though it’s a spin = 1/2 particle, just like the electron, simply adding the spins of the three quarks that make it up together isn’t enough. The three valence quarks in the proton, two up and one down, were initially thought to constitute its spin of 1/2. But that simple idea didn’t conform to experiments. Arpad Horvath. There are two things that contribute to angular momentum: spin, which is the intrinsic angular momentum inherent to any fundamental particle, and orbital angular momentum, which is what you get from two or more fundamental particles that make up a composite particle. (Don’t be fooled: no particles are actually, physically spinning, but “spin” is the name we give to this property of intrinsic angular momentum.) A proton has two up quarks and one down quark, and they’re held together by gluons: massless, color-charged particles which mutually bind the three quarks together. Each quark has a spin of 1/2, so you might simply think that so long as one spins in the opposite direction of the other two, you’d get the proton’s spin. Up until the 1980s, that’s exactly how the standard reasoning went. With two up quarks — two identical particles — in the ground state, you’d expect that the Pauli exclusion principle would prevent these two identical particles from occupying the same state, and so one would have to be +1/2 while the other was -1/2. Therefore, you’d reason, that third quark (the down quark) would give you a total spin of 1/2. But then the experiments came, and there was quite a surprise at play: when you smashed high-energy particles into the proton, the three quarks inside (up, up, and down) only contributed about 30% to the proton’s spin. There are three good reasons that these three components might not add up so simply. The quarks aren’t free, but are bound together inside a small structure: the proton. Confining an object can shift its spin, and all three quarks are very much confined. There are gluons inside, and gluons spin, too. The gluon spin can effectively “screen” the quark spin over the span of the proton, reducing its effects. And finally, there are quantum effects that delocalize the quarks, preventing them from being in exactly one place like particles and requiring a more wave-like analysis. These effects can also reduce or alter the proton’s overall spin. In other words, that missing 70% is real. Maybe, you’d think, that those were just the three valence quarks, and that quantum mechanics, from the gluon field, could spontaneously create quark/antiquark pairs. That part is true, and makes important contributions to the proton’s mass. But as far as the proton’s angular momentum goes, these “sea quarks” are negligible. Maybe, then, the gluons would be an important contributor? After all, the standard model of elementary particles is full of fermions (quarks and leptons) which are all spin = 1/2, and bosons like the photon, the W-and-Z, and the gluons, all of which are spin = 1. (Also, there’s the Higgs, of spin = 0, and if quantum gravity is real, the graviton, of spin = 2.) Given all the gluons inside the proton, perhaps they matter, too? There are two ways to test that: experimentally and theoretically. From an experimental point of view, you can collide particles deep inside the proton, and measure how the gluons react. The gluons that contribute the most to the proton’s overall momentum are seen to contribute substantially to the proton’s angular momentum: about 40%, with an uncertainty of ±10%. With better experimental setups (which would require a new electron/ion collider), we could probe down to lower-momentum gluons, achieving even greater accuracies. But the theoretical calculations matter, too! A calculational technique known as Lattice QCD has been steadily improving over the past few decades, as the power of supercomputers has increased exponentially. Lattice QCD has now reached the point where it can predict that the gluon contribution to the proton’s spin is 50%, again with a few percent uncertainty. 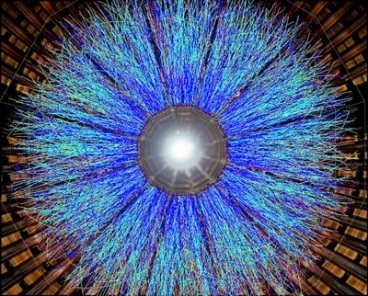 What’s most remarkable is that the calculations show that — with this contribution — the gluon screening of the quark spin is ineffective; the quarks must be screened from a different effect. The remaining 20% must come from orbital angular momentum, where gluons and even virtual pions surround the three quarks, since the “sea quarks” have a negligible contribution, both experimentally and theoretically. It’s remarkable and fascinating that both theory and experiment agree, but most incredible of all is the fact that the simplest explanation for the proton’s spin — simply adding up the three quarks — gives you the right answer for the wrong reason! With 70% of the proton’s spin coming from gluons and orbital interactions, and with experiments and Lattice QCD calculations improving hand-in-hand, we’re finally closing in on exactly why the proton “spins” with the exact value that it has. Our present digital information processing and storage is based on two properties of the electron. The first is its charge, which is used in electronic circuits to process information. 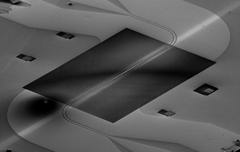 The second is its spin, which represents the information stored on a magnetic hard disk. Recent research attempts to make use of the charge and the spin of the electron simultaneously. This approach could enhance functionality, capacitance, energy consumption and speed of today’s information technology. 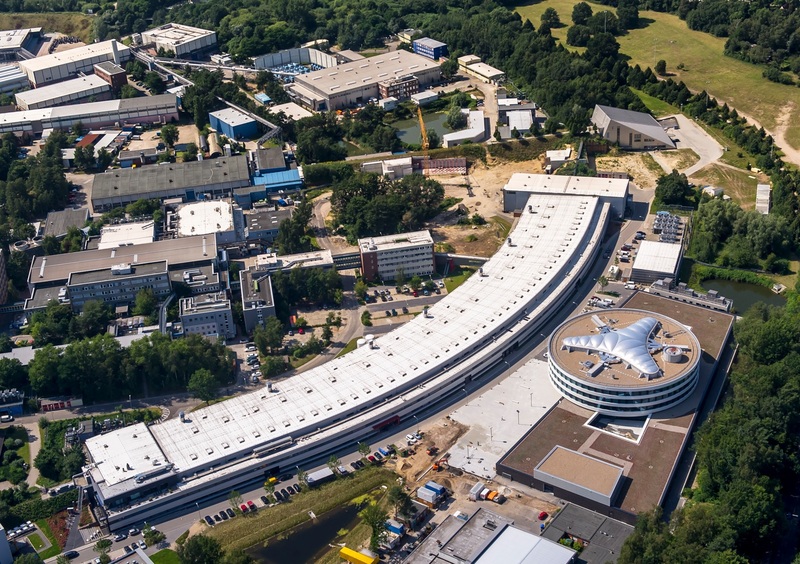 Researchers from DESY, from the Max-Planck-Institute for Structure and Dynamics of Matter, and from the University of Hamburg have now made a big step towards tracking the electron spin at very high frequencies that are technologically important. 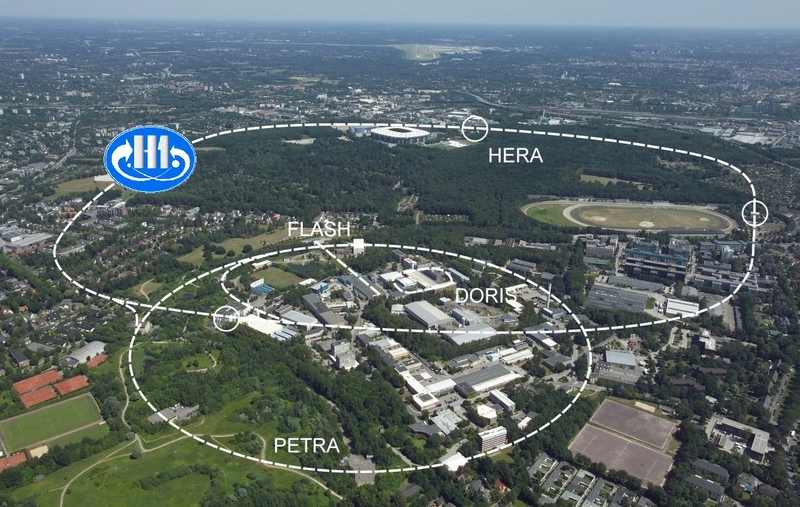 The team used the extremely brilliant X-rays generated at DESY’s PETRA III facility, to read out a nuclear sensor placed in the investigated magnetic material. In this way they could determine the motion of the, as the researchers report in the journal Physical Review Letters. ”The actual orbit of the spin is important as it determines many of the spin related effects that are under research now and proposed for new functional devices“, explains main author Lars Bocklage from DESY, who is also a member of the Hamburg Centre for Ultrafast Imaging (CUI). “Especially for data processing and mobile communication high frequencies are of importance. But even the fastest microscopy techniques available to determine spin motions reach their limit when it comes to the Gigahertz regime used in the present experiment.” A Gigahertz corresponds to a billion cycles per second. The trick in the new work is the use of a certain isotope of iron that contains one neutron more than the most prevalent iron isotope in nature. It can absorb X-rays of a specific energy, but reemits the X-ray after a very short time. This technique is called nuclear resonant scattering. The team around Bocklage found out in which way the X-ray emission is influenced by the motion of the spin. “This way the spin leaves a fingerprint in the photons emitted from the iron isotope, and the orbit of the spin can be identified,” explains Bocklage. The system that was investigated is a 13 nanometres (millionths of a millimetre) thin ferromagnetic film of nickel and iron, an alloy called Permalloy. The material was excited with an external magnetic high-frequency field that initiates a precession of the spins. This means the spin axes reel like a child’s top that has been nudged sideways. The exact motion of the spin was not known up to now. The investigations show that the shape and the amplitude can be precisely determined.